The Seniors remain in fourth position despite a narrow loss to second-placed Collegians at Harry Trott on the weekend, sending a message to those in flag contention that we are gearing up for the business end. Whilst a win would have confirmed a finals birth, that opportunity still lies ahead as we take on Old Melburnians this week at home. We would love to see as much support at Dairy Bell from the Blue & Gold Army as possible this Saturday. 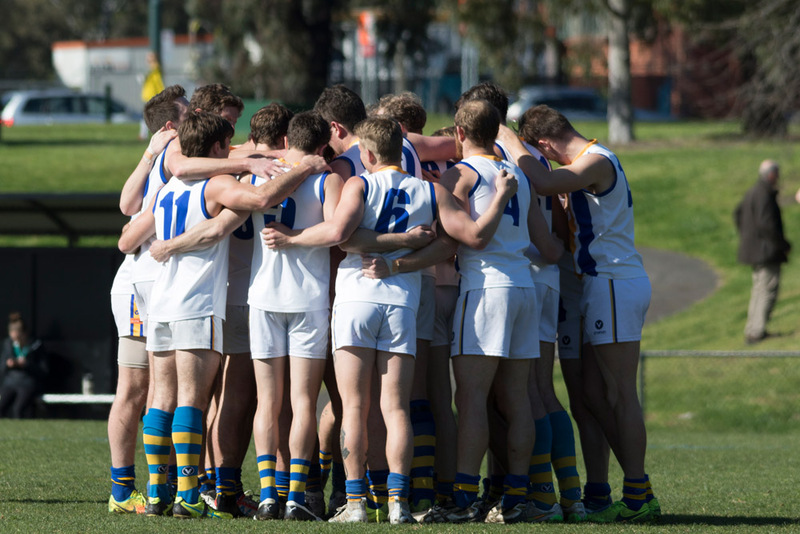 Our Two’s broke the drought for a two-point victory against Collegians much to the delight of coach Jock McDonald, and whilst finals are not on the agenda they will continue to fully support the Seniors campaign. Our Warriors went down in their semi-final to Old Scotch by 28 points. The boys now need to make their way through a Preliminary Final at 11am this Sunday at home against Ajax in what will be a sensational clash – please head down to support the lads. Our Unders sides continue to perform well. The competition is tight for our U19 Blues. A narrow two-point victory to the Blues, who sit fourth on equal points with St Kevins (2nd) and Old Xavs (3rd), the three teams separated by just 8%, as they continue to hunt the game-clear Beaumaris atop the ladder, who we beat last week by five goals on their deck. It’s fair to say an unpredictable finals series lies ahead! Our Golds sit second on the ladder and drew with 5th placed Old Scotch, with finals a certainty as we sit 2.5 games clear of third placed Old Xavs. Our Colts accounted for Fitzroy by some 86 points to go a game clear on top, with a huge finals series ahead to capitalise on their fantastic season. The Malvern Auto Tech Dinosaurs are looking to continue their unbeaten run as they charge ahead for the flag. The Dino’s are showing no signs of letting up, as they head into their semi final against St Kevins at Laurimar Reserve this Sunday at 1pm. St Kevin’s finished fourth but are widely regarded as the second best team in the competition behind our boys. The winner goes through to the big dance on Sunday September 10th at Casey Fields, loser is out. It’s all on the line!